Since it appears I’ll be fated to wait until the END OF TIME for my Modelkasten rigging wire to finish SMS Emden, I decided to start my SMS Baden build. Not much to be said about what I’ve accomplished other than adding torsion stiffeners to the hull interior to prevent warping and add some stability. HMV makes a nice kit but boy their hull form structure is quite light. I doubled every single stringer too, and it was still wiggly. I’m also trying a new glue, an archival scrapbooking glue called Zip Dry. I had some warping issues with Emden and that hull has about 1/3 the volume of this ship, so to mitigate I’m using a non-water based glue. It works well, to my mind at least and the hull is arrow straight and true. However, usual the usual disclaimer applies: I am a self-realized high-functioning idiot. I have had no joints fail, but it doesn’t seem to be as strong as PVA. That said, I’ll take less bonding power of warping at this stage. The superstructure and details will be constructed with PVA though. A little progress today, not much more than test fitting. I did double the decks, and while the instructions don’t call for this, the spans were just too large to complete without doing so. I compensated for this building the frame. Hopefully I didn’t miscalculate! This kit from HMV is a great one. I tip my hat to you, with all the work you went through to stiffen the frame. Thanks! Spending the extra time doubling all of the frames, adding the dampeners, and doubling the decks really paid off. It was probably 20x the work but the end result is rock solid. As you can see here, my measurements were correct. The pieces are dry-fit but they fell together nicely. Now that I know I’m spot on, I can add the internal stair detail, casemate guns etc, knowing that I haven’t made any big miscalculations. Oh and these photos haven’t been taken at home. I have a lot of down time at work, and this is an unused conference room. very solid hull. it does look like it's ready for internal details. My era is WW2 but these older dreadnaught era ships are very elegant. great work. While Bismarck wasn’t just an updated Baden, the Germans did reference her to some degree. With Baden we see the zenith of the German ship of the line, so while WWI may not be your era, I’m sure you’ll be interested in her. The Germans are an interesting study since they were forced to take a 15 year battleship hiatus. Scharnhorst and Gneisenau turned out okay-ish for what they were, Bismarck and Tirpitz were inefficient designs with critical areas remaining unprotected with their upgraded WWI era armor schemes. I think, if in a strange alternative universe, the Germans hadn’t taken that time off, we’d see ships of similar size to that of the Italian Littorio class. I’m not disregarding these ships since at the time they were laid down, there was no crystal ball predicting the future, and the Germans knew they were re-learning. Nor am I saying the Bismarck class was awful, far from it, but they weren’t as good as they could have been for the money. In naval design there are so many “if only” scenarios. Imagine the Littorio class, for instance, with good quality control with regard to their shells, and radar. They’d have been monsters. I don’t like to get into the weeds on details myself, the fog of war quickly makes ALL of these talking points moot in an instance. If you need an example, HMS Hood. It’s more about the stories for me. I like building models of these early Dreadnoughts because in their time, no weapon was more powerful, and they looked the business. Just plain fun to see how these designs evolved over time in my opinion. Nice clean straight building. Just for giggles and for the rest of us laymen! What and how, did you determine the amount too reduce the height of the formers. I have also thought of doing just the same, so reduce the thickness of material used from the height? I also have this same kit. Very interested in the glue. Do you mind my asking where one may purchase said stick'em? What are you building your hull on, a piece of laminated board or glass. I find the best way to build HMV kits, attach base of frame to sheet of glass w/contact cement. But always looking for the better way. Thanks for sharing and I will watch for progress. Really great job - the result is worth the effort - you can really see the accuracy and good alignment. 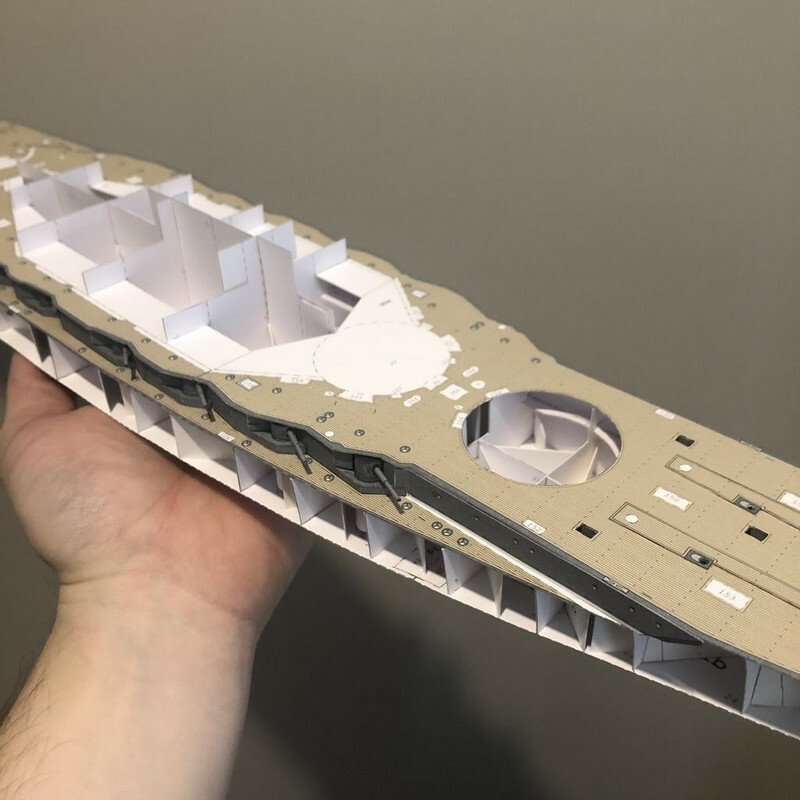 I’ve finished the starboard casemates and casemate guns, and having dry-fit everything, I’m pretty pleased that it all fit together and aligned more or less exactly how I’d planned. 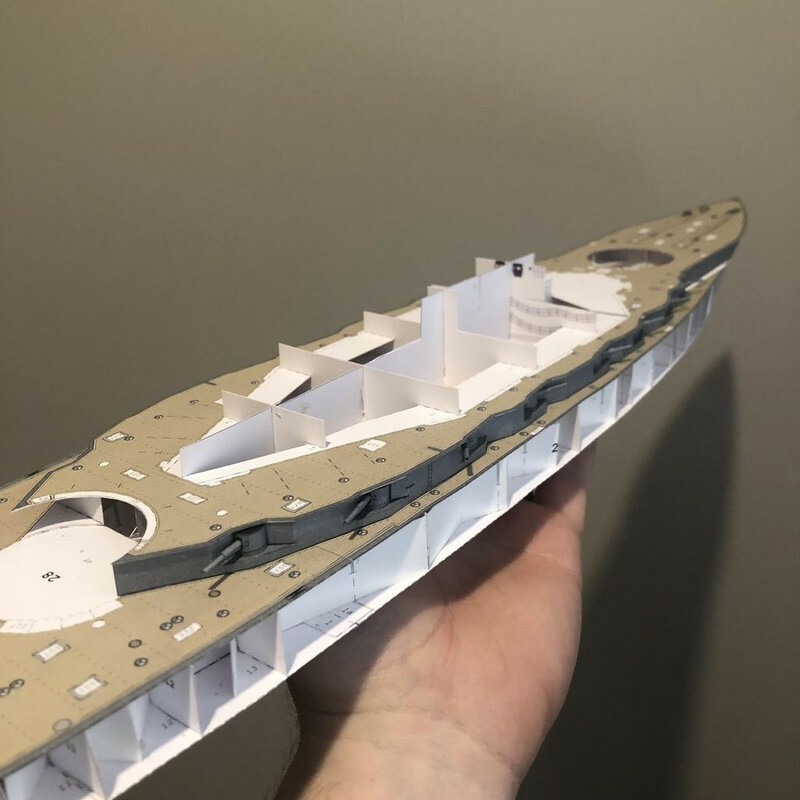 The photos below show the starboard casemates glues in place but the decks above aren’t fixed yet as I still have to build the port side. So if you see any goofy gaps, well that’s why. To answer your questions Paperclip, the Zip-Dry flue is available online or from Jo-Ann in the US. It works well for hulls with lots of joints, as the glue isn’t terribly strong but something with a lot of torsion supports is going to be rock solid with all of those joints. Strength in numbers so to speak. The goal was ZERO warping and it delivered. I had to compromise strength, but it was worth it for me. As for doubling the decks, formers, and stringers; the key is not to compromise the external dimensions, so always build inward and downward. The compensate for the deck, it was a matter of cutting the alignment slots just that much larger. Just adds another level of thinking.